Steph is a North West Coast local. She completed a Bachelor of Exercise Science at the University of Tasmania in 2011 and then moved to Adelaide to complete a Masters of Physiotherapy at the University of South Australia. Along the way she immersed herself into fitness instructing whereby gaining certificates in personal training and LesMills fitness programs. 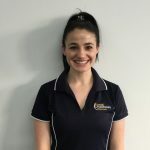 Steph has a keen interest in all the elements of physiotherapy; she is a physiotherapy consultant for the Burnie Dockers State league football team, specialises in Women’s Health Physiotherapy and is trained in DMA clinical Pilates. Outside of work Steph likes to keep fit by boxing, fitness instructing, mountain climbing and running.